Israeli diplomat confirms Mossad helped stop attempted assassination of the leader of the Danish branch of Iranian opposition group blamed by Tehran for attack on military parade in Khuzestan in which 25 Iranians were killed. The Mossad provided Denmark and Sweden with the intelligence used to thwart a plot by the Iranian government intelligence service to assassinate an Iranian Arab opposition figure on Danish soil, an Israeli diplomatic official confirmed Wednesday. The official said that due to increased efforts to foil attacks on Jewish and Israeli institutions, the Israeli spy agency collects a lot of information, including intelligence about plots that don’t necessarily target Israel or Jews.It is believed the Israeli-provided information allowed the Danes to stop the assassins, who had explosives in their possession, early on. According to Danish intelligence chief Finn Borch Andersen, the attack was meant to target the leader of the Danish branch of the Arab Struggle Movement for the Liberation of Ahvaz (ASMLA)—an opposition organization that Tehran blames for a September 22 shooting attack on a military parade in Khuzestan in which 25 Iranians were killed, many of them Revolutionary Guards troops. After the attack in Khuzestan, Iran summoned the envoys of the Netherlands, Denmark and Britain and accused the three countries of harboring Iranian opposition groups. On October 21, a Norwegian citizen of Iranian background was arrested in Sweden in connection with the plot and extradited to neighboring Denmark, Swedish security police said. The suspect has denied wrongdoing and is being held in pre-trial custody until November 8. The Iranian government also denied any connection with the alleged plot. On Wednesday, Iran expressed a “strong protest” to Danish ambassador to Tehran Danny Annan over what it described as the Danish officials’ “hasty, political” and “uncalculated actions” in the case. This is the second time in the past few months that Iran has been accused of trying to harm exiled Iranian opposition activists on European soil. In June, France foiled an attempted Iranian attack on an Iranian opposition conference in Paris. That attempt was also thwarted with the help of the Israeli Mossad. “The Mossad’s efforts have led to thwarting Iranian terrorism in France, Belgium, Austria, Germany and now Sweden and Denmark,” an Israeli official said. Hyundai Engineering scraps deal to build petrochemicals complex in Iran, saying Iran’s ability to fund project likely to be hit by the prospect of U.S. economic sanctions • Expert: Iran likely to turn to China or Russia to help finance the project. South Korea’s Hyundai Engineering & Construction said on Monday that it had scrapped a $521 million deal to build a petrochemicals complex in Iran because Iran’s ability to fund the project has been hit by the prospect of U.S. economic sanctions. Hyundai had signed a contract to build the complex on the Persian Gulf coast, near the southern town of Tonbak, in March 2017. South Korean and Iranian media said the contract was for the construction of the second phase of the Kangan Petro Refining Complex in the South Pars Gas Field. In a regulatory filing, Hyundai said the consortium it was leading for the project canceled the contract on Sunday. “The contract was canceled because financing is not complete, which was a prerequisite for the validity of the contract, as external factors worsened such as economic sanctions against Iran,” Hyundai said in its filing. The United States plans to reimpose sanctions against Iranian crude oil exports as part of President Donald Trump’s efforts to force Iran to accede to a more restrictive deal on limiting its nuclear and missile programs. A day after Hyundai made the announcement, there were no mentions of it in Iranian state media. “Now, the Iranians have to more or less start over and find somebody new. All of this takes time. As it takes time, the Iranian economy sinks,” Johns Hopkins University applied economics Professor Steve Hanke said. He said that it was likely that Iran would turn to China or Russia to help finance the petrochemical project. Iranian Foreign Ministry spokesman Bahram Qassemi accuses Washington of launching a “psychological war” against Tehran by imposing “inhumane and confrontational sanctions” to hurt the Iranian economy • EU signatories to the nuclear deal remain committed to it. U.S. sanctions against Iran will have “severe consequences” for the world order, the Islamic republic said on Tuesday, days before new sanctions on Tehran’s oil exports take effect. Washington reintroduced sanctions against Iran’s currency trade, metals and auto sectors in August after it pulled out of a multinational 2015 deal that lifted sanctions in return for limits on Iran’s nuclear program. “Unfortunately a law-breaking country [the United States] seeks to punish a country [Iran] that is abiding by the law. This method will have severe consequences for the world order,” Foreign Minister Mohammad Javad Zarif was quoted as saying by the state-run Islamic Republic News Agency during a visit to Istanbul. Tehran says it has complied fully with the nuclear accord and its commitment has been repeatedly confirmed by the U.N. atomic watchdog, International Atomic Energy Agency. European signatories of the nuclear deal are still committed to the accord and will soon launch a mechanism, a so-called special purpose vehicle, aiming to sidestep the U.S. financial system by using an EU intermediary to handle trade with Iran. Iranian Foreign Ministry spokesman Bahram Qassemi also accused Washington of launching a “psychological war” against Tehran by imposing “inhumane and confrontational sanctions” to hurt the Iranian economy. Iran’s Revolutionary Guards have sent weapons and thousands of soldiers to Syria to help shore up Assad during the seven-year civil war there. Iran’s rial currency has lost 70% of its value this year because of a weak economy, financial difficulties at local banks and heavy demand for dollars among Iranians who fear the effects of sanctions. Denmark recalls its ambassador to Iran over a foiled Tehran plot to kill three Iranian dissidents on Danish soil • Denmark consulting with “partners and allies,” including the European Union, about possible sanctions, Foreign Minister Samuelsen says. Denmark has recalled its ambassador to Iran after it accused Tehran of plotting to kill three Iranian dissidents living in the Scandinavian country. “I have decided to recall Denmark’s ambassador in Tehran for consultations. 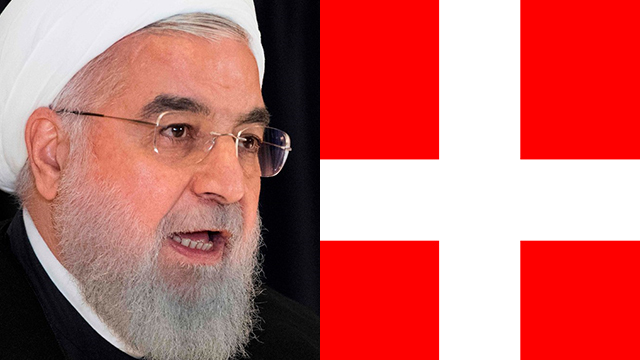 Denmark can in no way accept that people with ties to Iran’s intelligence service plot attacks against people in Denmark,” Samuelsen told reporters. Iranian Ambassador to Denmark Morteza Moradian has been summoned to the Foreign Ministry in Copenhagen and it was made “crystal clear” to him that “the gravity of the matter is difficult to describe,” Samuelsen said, adding he was consulting with “partners and allies,” including the European Union, about possible sanctions. Iranian Foreign Ministry spokesman Bahram Qassemi said in a statement that Tehran “strongly denied” the allegations, the semi-official Tasnim news agency reported. A police operation last month that briefly cut off Copenhagen from the rest of Denmark stemmed from an alleged Iranian plot to kill an opposition activist, the head of Denmark’s intelligence agency said Tuesday while announcing a suspect’s arrest. A Norwegian citizen of Iranian descent was arrested Oct. 21 on suspicion of helping an unspecified Iranian intelligence service “to act in Denmark” and of alleged involvement in the assassination plot, Danish Security and Intelligence Service Director Finn Borch Andersen said. The suspect was seen taking photos of the residences of members of the Arab Struggle Movement for the Liberation of Ahwaz (ASMLA) in Ringsted, a town some 37 miles southwest of Copenhagen, he said. The suspect has denied wrongdoing and is being held in pretrial custody until Nov. 8, Borch Andersen said. He did not name the Norwegian. “This is a case that entails an Iranian intelligence operation in Denmark, In our view, it was an Iranian intelligence agency’s plan to assassinate a person who lives in Denmark,” he said. Tehran has blamed ASMLA for a terrorist attack on a military parade in the Iranian city of Ahvaz on Sept. 22 that left at least 25 people dead. ASMLA condemned the violence and said it was not involved. 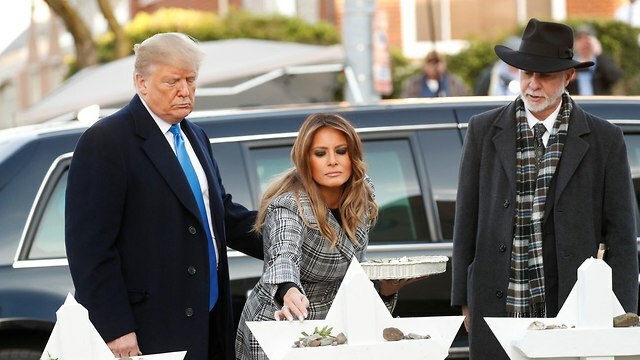 Near the synagogue, flowers, candles and chalk drawings filled the corner, including a small rock painted with the number “6,000,011,” adding the victims this week to the estimated number of Jews killed in the Holocaust.The Trumps later spent more than an hour at the University of Pittsburgh Medical Center, where some of the victims are recovering. 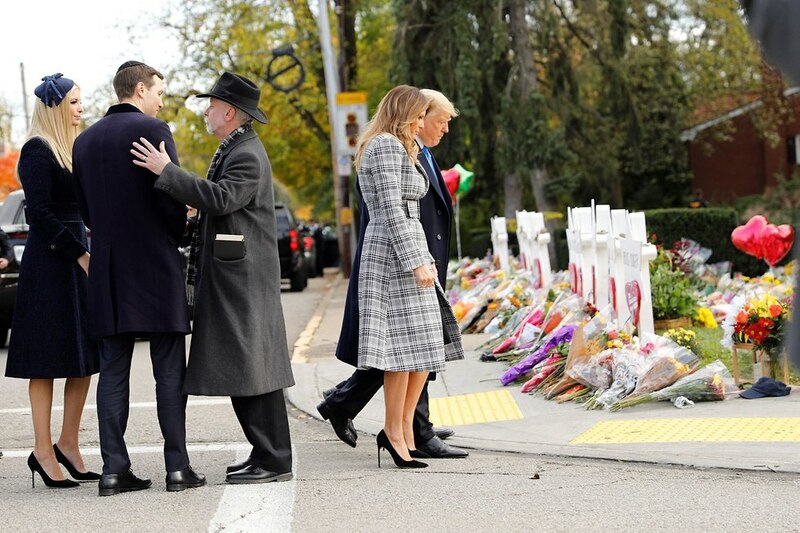 The couple’s motorcade passed several hundred protesters on the street and a sign that said “It’s your fault.” Inside, Trump visited with wounded police officers and spent an hour with the widow of victim Dr. Richard Gottfried, according to White House press secretary Sarah Huckabee Sanders.Trump stepped into the role of national consoler, a title he wears uncomfortably, with his visit to the Squirrel Hill neighborhood. More at home waging partisan warfare than assuaging America’s grief, Trump has shied away from public displays of unity in the wake of other tragedies. The threat of “consequences to the world order” may be translated into such options as Iranian disruption of world oil supplies, a substantial military attack on US or Arab Middle East targets, on Israel – or all of these actions in successive stages. Iran has concentrated in Iraq and along its Gulf coast large numbers of Saeghe stealth drones (modeled on the advanced US RQ-170 Sentinel captured by Tehran in 2011). Al Qods Brigades forces operating in Syria have also been armed with these sophisticated drones. UAVs of different types were given to the Iraqi Shiite militias serving Tehran at home and in Syria as well as the Lebanese Hizballah. 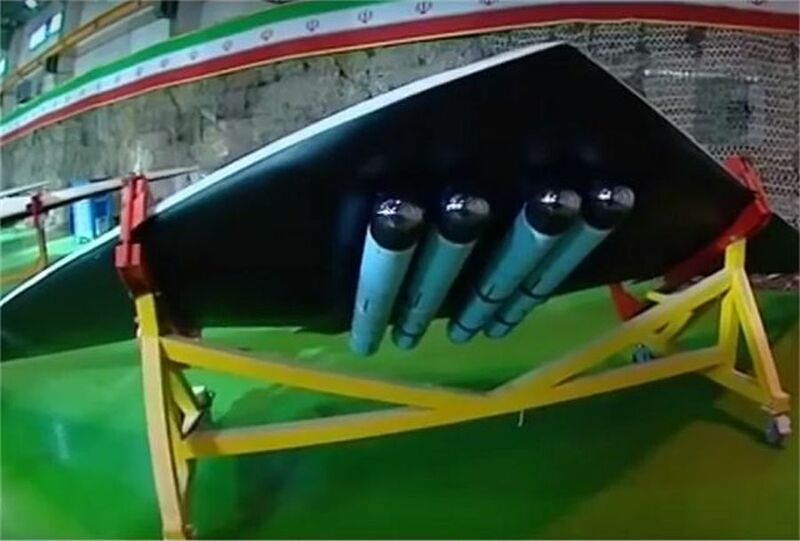 The Saege drones have taken over the tasks of the exploding speedboats formerly used by Revolutionary Guards as primary weapons against Western and Arab oil tanker shipping in the Persian Gulf. The Iranian drone attack on ISIS concentrations in eastern Syria on Oct. 1 appeared to many Western and Middle East military experts to have been a kind of dress rehearsal for the use of this UAV for deadly air strikes on US, Israeli or Arab targets. Then, 11 of these stealth drones were launched from Iran and flew across the entire width of Iraq to reach their targets, without being intercepted or even sighted by US, Israeli or Jordanian forces. The Saeghes hit Syrian base with miniature, precision-guided Sadid-345 glide bombs. Then, this Revolutionary Guards weapon made its debut performance in real combat conditions and returned safely to base. Al Qods chief Maj. Gen. Qassem Soleimani has been placed in charge of all forthcoming Iran’s military preparations. Famed economist and New York Times columnist Paul Krugman suggested that Trump was to blame, at least in part. This past Saturday, the Jewish day of rest, a middle-aged man burst into a baby-naming service at a Pittsburgh synagogue. What followed was the deadliest antisemitic attack in American history. Eleven men and women, who had come only to celebrate and to pray, were gunned down, their blood pooling around their scattered prayer books. A heroic team of local police officers charged the shul under heavy fire. Though many sustained severe wounds, the massacre was finally brought to an end. The gunman was captured and should, in my opinion, face the death penalty. The shooter, 46-year-old Robert Bowers, announced his arrival at the synagogue by screaming “all Jews must die.” He allegedly later told police officers that Jews were committing “genocide against his people.” Pretty ironic, that. A racist Jew-hater claiming the Jews are guilty of genocide just one week before the 80th anniversary of Kristallnacht. DESPITE THESE facts, however, many people have come close to blaming Trump for the shooting. To politicize the murder of 11 Jews – let alone the worst antisemitic attack on American soil in our nation’s history – is lamentable. Antisemitism and its tragic incarnation in this devastating attack are caused by those who actually hate Jews and call for violence against them. Sadly, there has never been a monopoly on antisemitism. It stems from both the extreme Left and the extreme Right. It was the hard Left that first accused the Jewish state of genocide and the IDF of being the Gestapo, and it has for years depicted Israel and the Jews within it as oppressors and murderers who deserve the waves of terrorism that they are repeatedly forced to endure. Witness Jew-haters like Nation of Islam leader Louis Farrakhan, who just last week employed the worst Nazi verbiage by calling Jews “termites,” directly implying the need for their extermination. We dare not forget Students for Justice in Palestine, which holds tributes for terrorist “martyrs,” such as Dalal Mughrabi, who carried out the greatest antisemitic attack in Israel’s history, murdering 38 Israelis, seven of whom were under the age of six. Then we could point to the extreme Right and the growing number of neo-Nazi filth who march in Charlottesville to the chant of “Jews will not replace us.” We could certainly blame the festering scourge of white-supremacist scum, who have increasingly turned to violence to express their hate-riddled minds. Both extreme Left and extreme Right have shown horrible strains of antisemitism. We must also blame nations like Iran that openly call for and fund violence against Jews across the world. We must also point to those who’ve offered them support. I will not politicize the murder of 11 Jews, so I will not point fingers or name parties. But dare not forget that the Iran nuclear agreement was negotiated by the United States, all while the mullahs threatened Israel with complete annihilation. Will those who negotiated it expect us to overlook their agreement with Iran, despite the nation’s funding and execution of arguably the deadliest antisemitic attack in modern history at the AMIA Jewish Community Center in Buenos Aires, which left 85 dead and hundreds more wounded? Do the parties that were in power then assume we will forget that they insisted on forking over billions of dollars in cash to this international standard-bearer of antisemitism, while never once condemning those mullahs for their unspeakable sins in both word and action? AS A Jew I am extremely grateful to President Trump for the unparalleled support he has shown Israel in the Oval Office. But that did not stop me from publicly and strongly criticizing the president for his failure to sufficiently condemn the white supremacists in Charlottesville. There was nothing but evil on the neo-Nazi side. But if we are to criticize serious failure, as we must, then we must similarly laud significant success. In defending Israel, Trump has exceeded our expectations. He and his soon-departing Ambassador to the UN Nikki Haley brought the fight for Israel at the UN to the highest bar yet. He moved the American Embassy to the Jewish people’s eternal capital in Jerusalem, which neither George W. Bush nor Barack Obama did, despite the latter’s promises to do so in 2008. Trump has already made the decision to remove our nation from the disastrous nuclear agreement signed with Iran, which he called out as a “rogue state.” As we speak, his administration continues its work to reenact sanctions and clear a way out of the Iran deal, not only for our own nation but for our allies in Europe and across the world. Trump also signed into law the Taylor Force Act, which sought to put an end to the Palestinian Authority’s sadistic practice of handing out actual monetary rewards to those who’ve killed Jews. Believe it or not, throughout the Obama administration, the PA was giving out enormous sums to those serving prison sentences for murdering or attempting to murder Jews in Israel. In the last year, the PA distributed over $315 million – or 8% of its entire overall budget – through its outrageous system of terrorist-welfare. All this, from the hundreds of millions of dollars the PA receives annually from the United States in foreign aid – or received, considering Trump has finally begun to cut it. In fact, if Bowers had been a Palestinian and his 11 victims Jews living in Israel, he and his family would have been collecting from their terrorism pension for the rest of their lives. And, until the passing of the Taylor Force Act, he would have thanked us for the cash. Ultimately, though, what makes the accusations of antisemitism against Trump especially unfair is the fact that beyond just having Jewish friends and associates, he is the first president of the United States to have Jewish children and grandchildren. Even Trump’s worst enemies would admit that he loves and deeply cherishes his daughter Ivanka, who is herself an Orthodox Jew. He supported her decision to join the Jewish people through the strictest processes of conversion, before throwing her a kosher wedding. Through his daughter, Trump now has three Jewish grandchildren who attend Jewish schools. 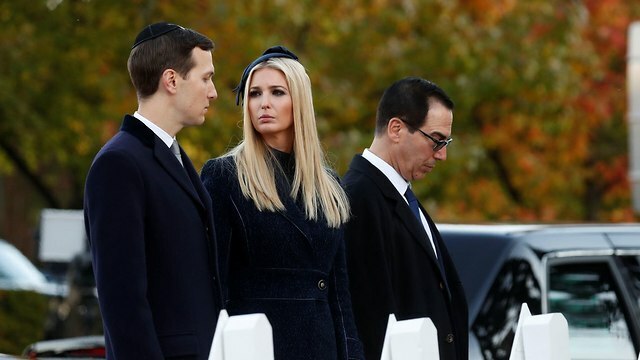 His son-in-law, Jared Kushner, and Ivanka regularly attend synagogue themselves. For Trump, the looming threats facing Jewish community centers have become, if anything, entirely personal. As yet more Jewish blood is absorbed into the earth, we cannot allow these events to be sharpened into political spears to be hurled against political opponents. That would only deepen the divides within a nation that direly needs to heal. We must instead take a moment to reflect upon who are the ones truly spreading hateful gospels against the Jewish people, and do everything in our power to ensure that they are weakened, silenced and eventually brought down. The writer, “America’s Rabbis,” whom The Washington Post called “the most famous rabbi in America,” is founder of The World Values Network, a leading organization defending Israel and the Jewish people in global media. His most recent book is The Israel Warrior. Follow him on Twitter @RabbiShmuley.